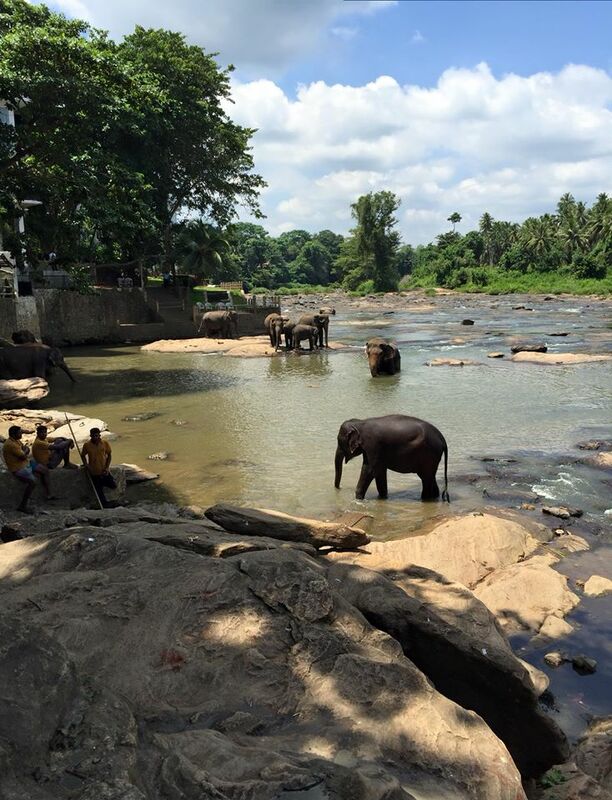 I fell in love with Sri Lanka at the time of landing. Early in the morning, a beautiful sunny day. The Emirates’ aircraft was already over the island, when I woke up and looked through the window. I have never seen so many palms anywhere else. 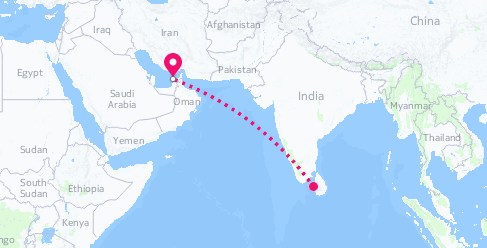 Sri Lanka is literally covered by palm trees and from a bird’s eye it looks like an endless green sea. Still dizzy from the sleep, I was bewitched by its beauty. I was about to land at the most mysterious and magical island I have ever been to. I read a lot prior to my trip, trying to get prepared for what I am going to face in Sri Lanka. But despite all my efforts, this island managed to surprise me. There is everything here. Mountains, lakes, rivers, large green valleys, beautiful ocean, white sandy beaches, plenty of history, delicious unusual food. And in addition, I have never seen so many smiling, calm and down to Earth people, gathered at one place. I did not understand a word from their language, but whatever the locals say, they do it with a smile. Where all this patience comes from, I have no idea. Most of the Sri Lankans are really poor, but it doesn’t change their gentle attitude. My impression for humble people, who have honourable limits in their expectations for income, generated from the tourists. The humility and smiles were well kept in my heart. I was told this type of moderate attitude is brought mostly by the religion. 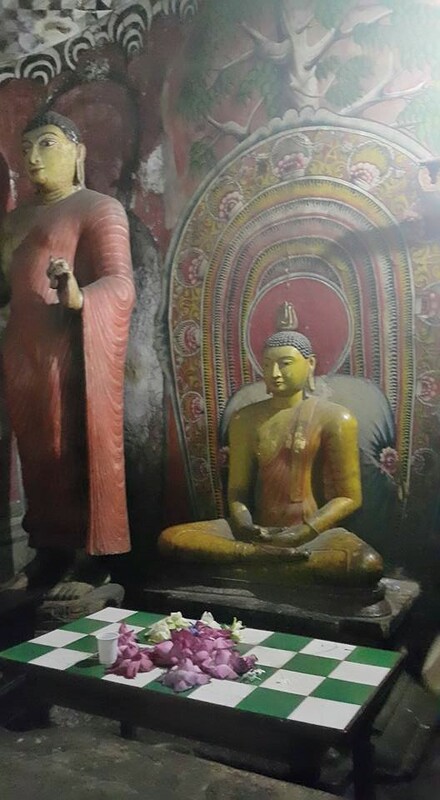 About 70% of the Srilankans are buddhists. 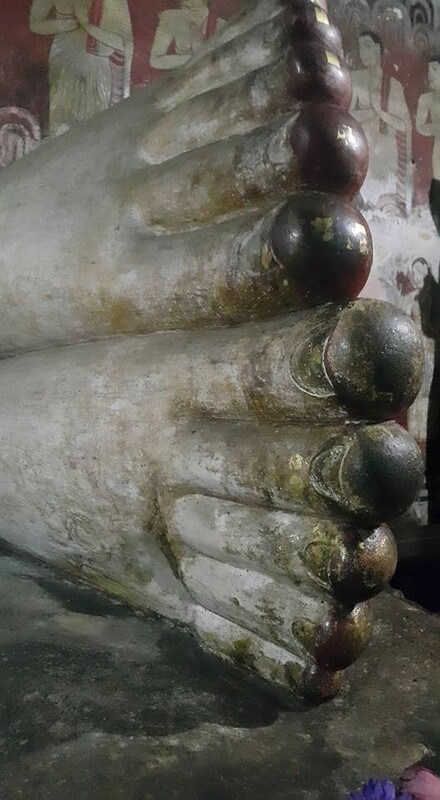 The rests are mixed – Muslims, Christians and Hindu. All of them, regardless their religious beliefs, seem to be “infected” by the total calmness and smiling daily appearance. Whatever it was, the inhabitants of this green island are definitely blessed. I truly enjoyed their positivity and optimistic approach to life. Their contagious smile affected me and I was unable to retract my lips during those 10 days in Sri Lanka. The occasion to visit the island came along with an invitation for kite surfing lessons. In Northern Sri Lanka it seems to be really windy from April to October, so the kite surfing is extremely popular in there. I heard about at least 5 kite surfing schools, but mine was truly impressive. Awesome atmosphere, inspired by kite surfers from all over the world. I met a French couple, expats in China. A German couple, expats in South Africa. Plenty of Swiss, Dutch, Belgian and German kite surfers, on vacation, keen to live in the kite surf camp for more than a month. The free spirit was everywhere – casual clothes, no make up, flip flops dress code, simple friendly relations, clear rules. Out of the kite surfing schedule, the local food, cooked at the camp, was fantastic. Lots of sunbathing, beer nights and late chat. I can’t imagine a better place to be, despite my poor kite surfing performance. I was the only guest, who was unable to reveal the mystery of catching the wind, so I finally failed. During my very first lesson (out of the water), I literally furrowed the ground by my face. In my second lesson (inside the water), I did my best to drink out the lagoon. Being a loser is a terrible feeling. But my instructor and owner of the camp Mike was patient enough to calm me down. He politely explained to me with some people it takes time. Being compassionate to my embarrassment, Ross, the manager, told me his own kite surfing story. Teaching himself with no help, being hopeless, in a month he jumped on the board and managed to kite. Well… I did not have a month and was already too embarrassed to daily demonstrate my clumsy efforts. I just accepted I am not going to be a kite surfer, also won’t be able to make all those air tricks and jumps out the water. What else could I do? To explore the island of course. 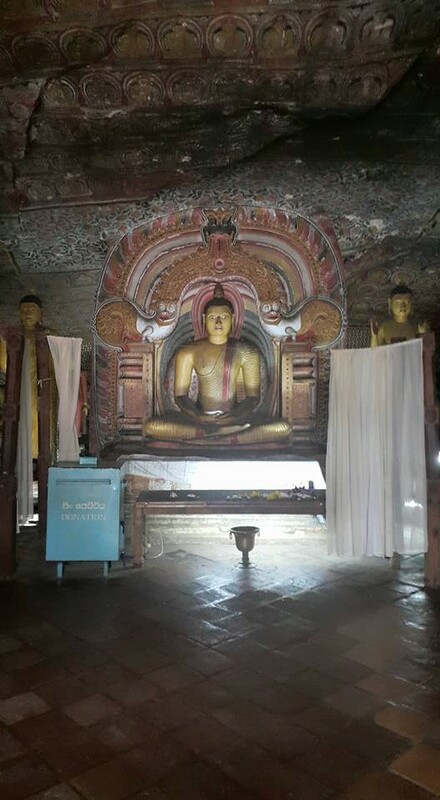 Mike helped me a lot to overcome my embarrassment by arranging a trip to Kandy and Sigiriya. Charmed by the history and the legends there, I was supposed to forget my kite shame. It worked out. 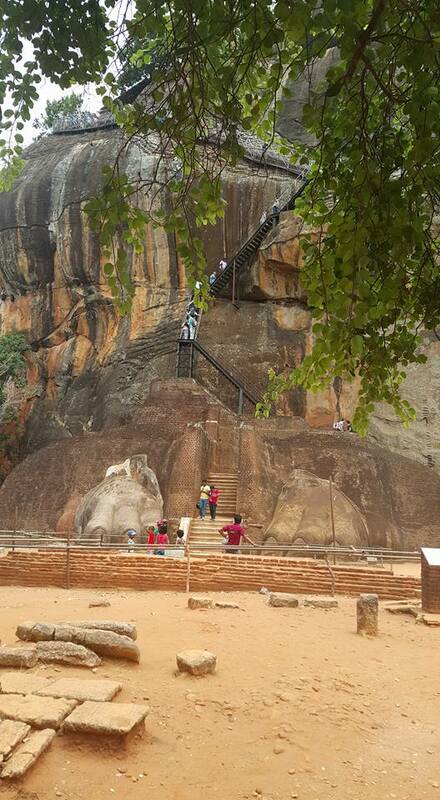 My mind was blown away when I stepped at Sigiriya. I won’t be able to recall the legend about this bizarre single rock in the middle of nowhere. On the top of that rock used to live the ruler of the island (about 1600 years ago) for the half of the season. The palace was just at the top, where the king had been carried on his servants shoulders. 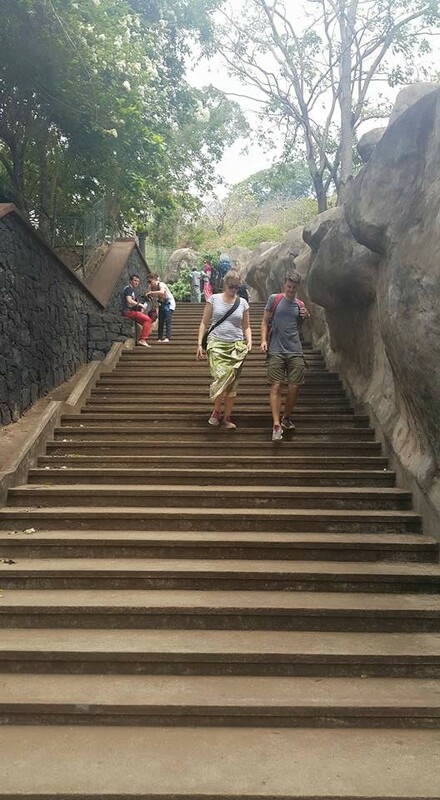 They climbed the thousands of stairs up. The other half of the season, the king spent down the rock, where the swimming pools were located.These were large artificial pools, filed by rain water, where the concubines were bathing. They were fighting for the king’s attention, by swimming, playing and being creatively seductive. 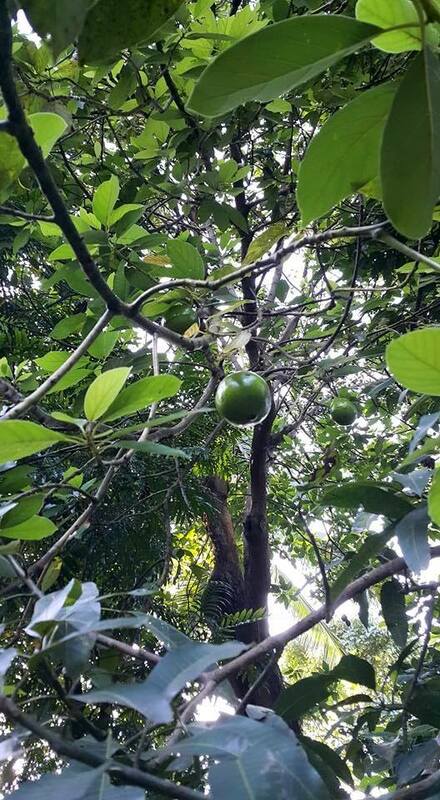 I experienced by myself the climbing. Poor king’s servants, it’s tough to climb handling even your own body. I can’t imagine what is to carry the king up to the top through this declivitous, sharp and narrow route. Now the stairs are safe, secured by handrails, but they did not exist in the past. Seems to me extremely dangerous. Even now, it’s a bit tricky, while climbing to the top of the rock. Beautiful frescoes accompany the climbers. 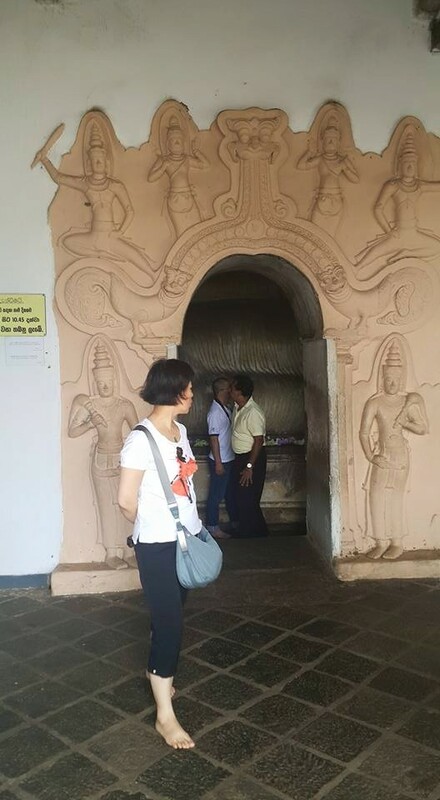 My guide explained to me in details nationalities of the concubines, owned by the king. 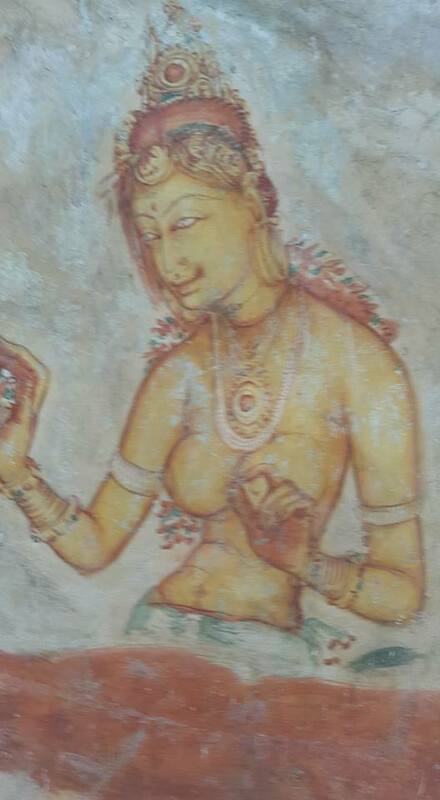 They were immortalised and exposed on those frescoes. 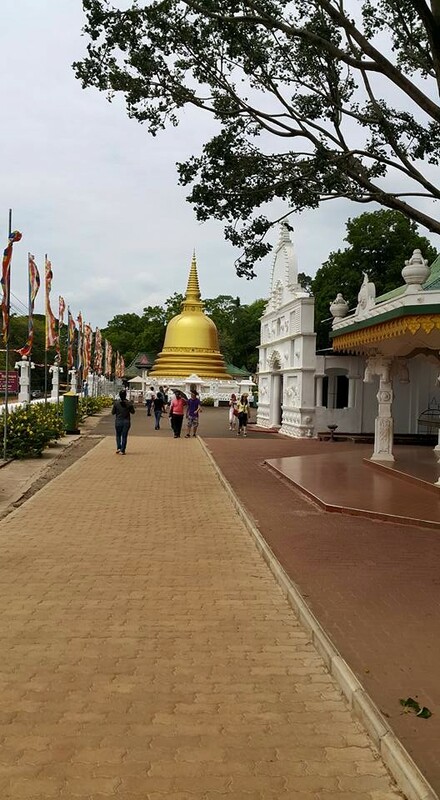 Sri Lankans, Indians, Nepali, Bengali, Mongolians, etc… 11 to13 different ethnic groups. 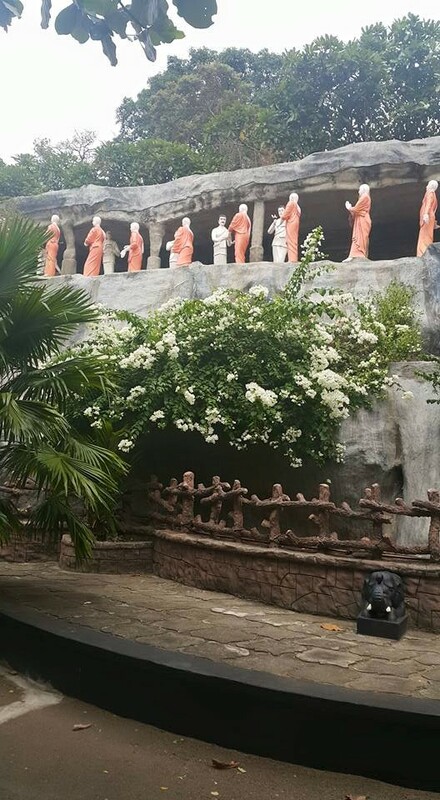 They are still alive there on the rock’s wall, with all the natural colours and native characteristic. 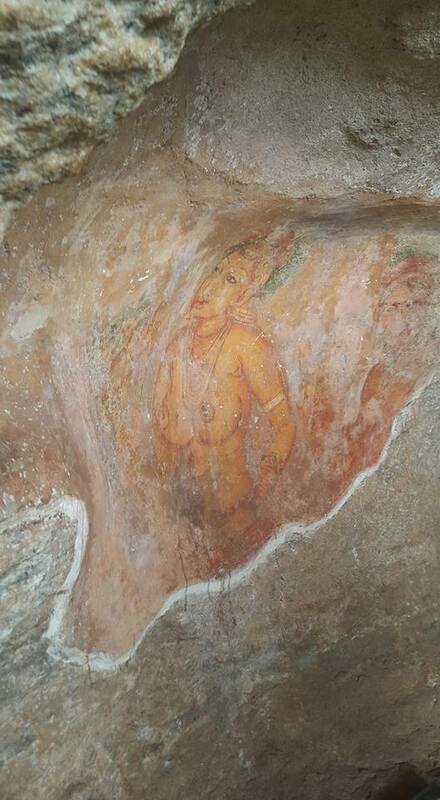 There is an ancient painting on the wall, that behaves like a contemporary 3D or 4D image. Wherever you move, the face from the image is following your direction and always watch you. It’s unbelievable, because the painter created it 1600 years ago by unknown extraordinary technique. 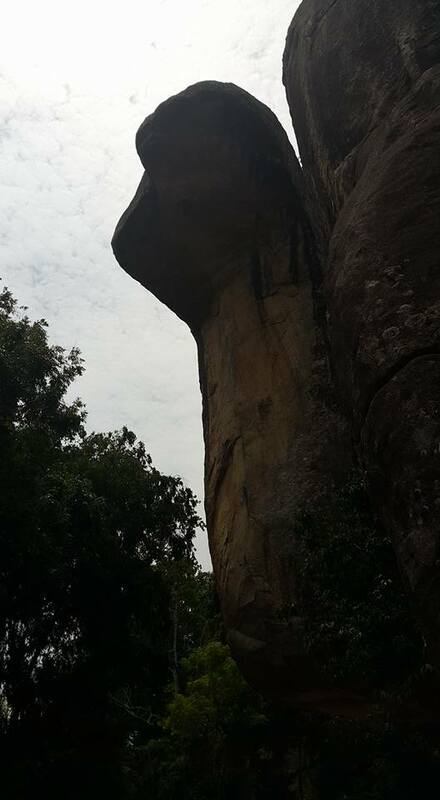 Going upper, you can see the famous Cobra rock and the Lion rock ( they really look like heads of animals). 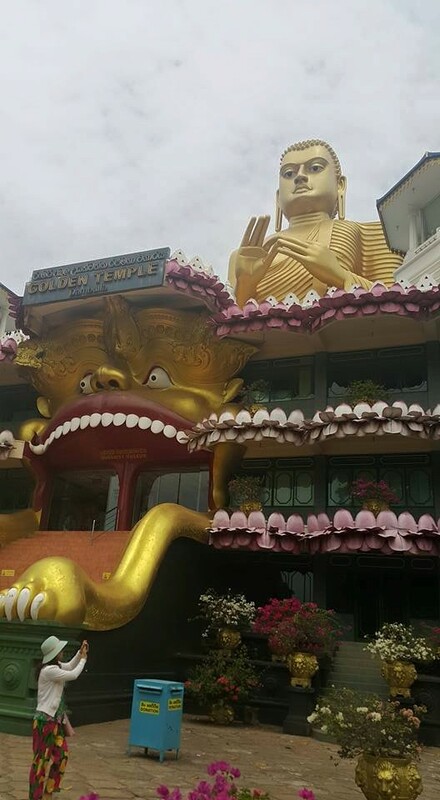 I also visited the temples of Dambulla, Buddha tooth relic temple in Kandy, the Botanic garden, Spice garden and the elephant sanctuary on the way. All of them are worth to see, so I would recommend to. 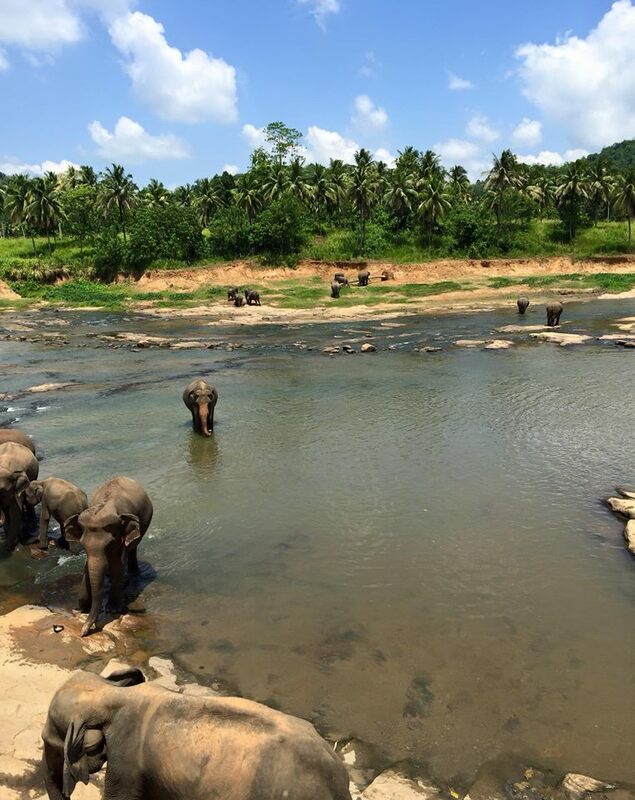 In Sri Lanka you can still watch close ups ( if you are lucky) of wild elephants, living freely in the jungle. They cross the road from time to time or pass by the hotels deep in the forest. Lots of road signs warn to be cautious and remain calm in case of such a close meeting. I was very lucky to see both – elephant orphans in the sanctuary, who are quite used to the tourists. Also I saw wild elephants, just coming out on the road. 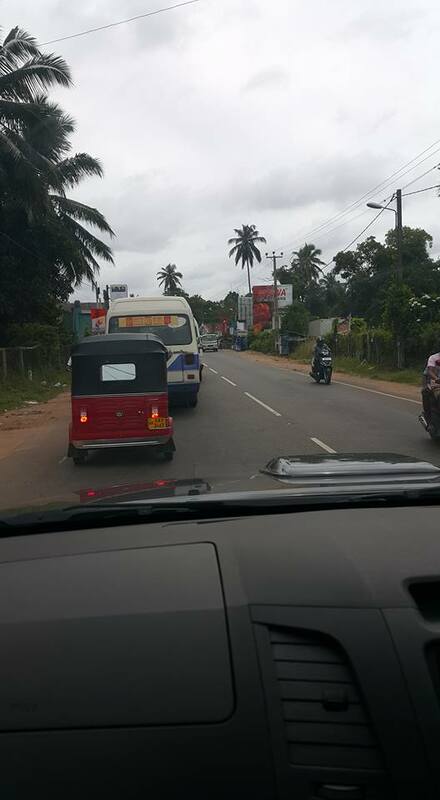 It happened on the way to Ayurveda holistic centre, near Sigiriya. 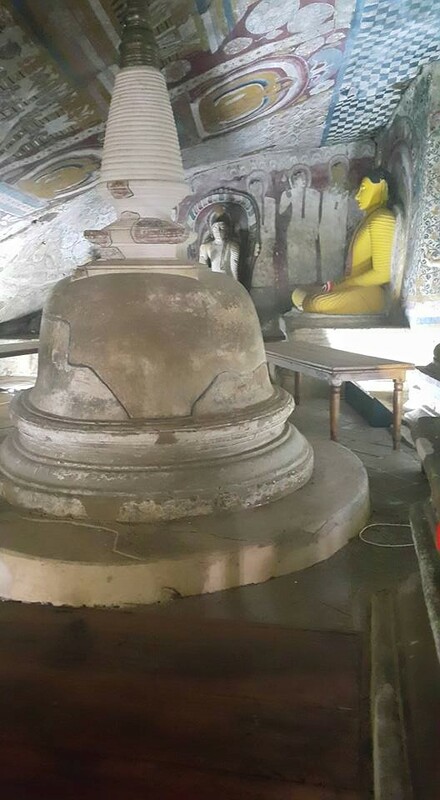 At a spiritual place like Sri Lanka, spirit goes free everywhere. My spirit went mostly curious to experience every unknown, but potentially interesting local practice. I heard of Ayurveda before, but my knowledge was limited. I imagined it as a mysterious Eastern massage technique, that helps to relax and calm down. I couldn’t be more mistaken. It’s a holistic (whole body) healing system. The locals seriously consider it as medicine. Transmitted from India thousands of years ago, Ayurveda is quite popular in Sri Lanka. It’s based on the belief that health depends on the balance between mind, body and soul. In my case, I experienced only the wellness side of Ayurveda, provided via combined sitting/laying massage, herbal body oil, followed by natural steam bath in wooden cabin. The outcome is focused on the oil effect, not much on the massage itself. The masseur is improving the blood circulation. The herbs in the oil are supposed to go deep under the skin. The steam bath supports the process by opening the skin cells for the oil ingredients. It was mystical. My body enjoyed that healing procedure. It was a very limited touch to Ayurveda, but at least I partially got a sense of. 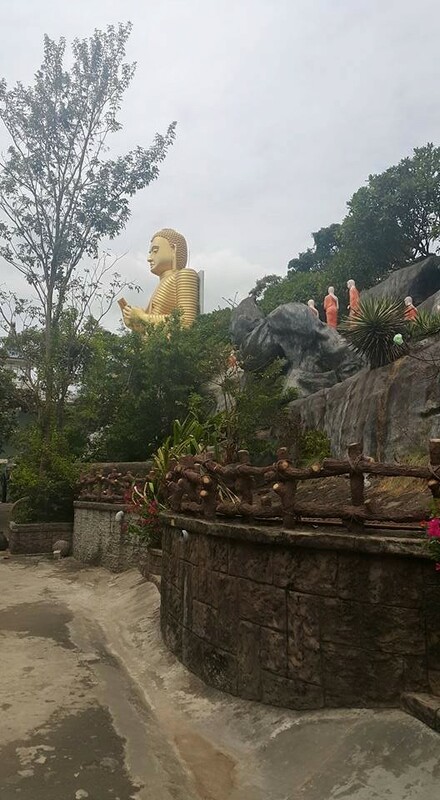 Sri Lanka is popular with its best cinnamon, plenty of spices and medical herbs. I requested the experts at Spice garden to let me know how to recognise the real cinnamon powder from the fake one. In Europe could be found mainly low quality packed cinnamon powder, mixed with other herbs and chemicals. The explanation I got – the real cinnamon should be a bit sweeter, when you taste it and has darker colour than the fake one. To make sure I won’t be mistaken, I secured my cinnamon supplies directly from Sri Lanka. In Sri Lanka are broadly used the same spices like in India. But the meals are quite different in Sri Lanka. 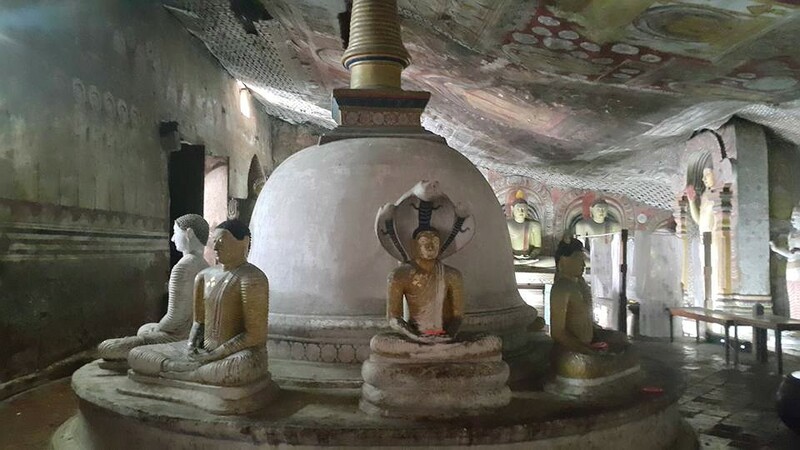 There is a unique Srilankan cuisine. I really liked it and enjoyed it, lots of cooked vegetables. I still cannot make any difference between manioca and tapioca, but they cook both of them. 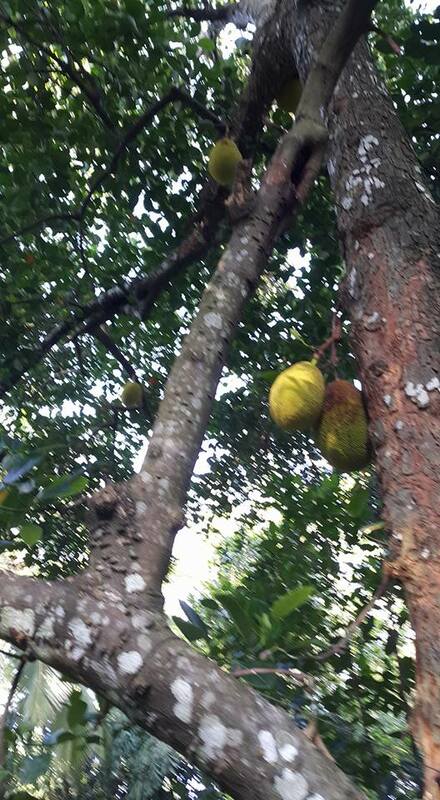 Also the Jack fruit is used as a vegetable and cooked as a main dish. Spinach, sweet potatoes, okra, peas, egg plants, parsley, rice – all those are cooked spicy. The island is full of European tourists, coming from Germany, the Netherlands and France. 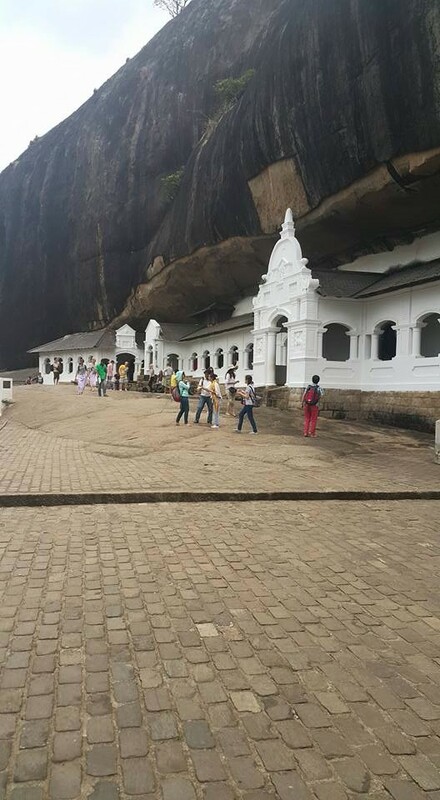 Their number is growing monthly and at the moment Sri Lanka is a preferred newly discovered tourist spot. It was named “rising holiday star“. Very popular is to combine holiday Sri Lanka – Maldives, as Maldives is just an hour flight away. I saw many couples getting married in Sri Lanka and heading to Maldives for their honeymoon. Or the opposite, getting married at the luxury of Maldives and then leaving to the adventurous side of Sri Lanka. Large plantations of Ceylon tea welcome the tourists all year round. The tea fields are located in the middle of the island, mostly in the mountains. It usually very humid there. Often the visitor should climb the slops to the tea plants. The procedure of tea leaves picking is one of the preferred attractions for the tourists. On site everyone is able to order a variety of Ceylon teas, usually consumed with milk, non- sweetened. I am not a big tea fan. Despite that, during my Sri Lankan stay, I replaced my morning cappuccino by milky Ceylon tea. I was trained to prepare it and drink it properly. I would like to thank my great Sri Lankan friends. The always patient and smiling Kumdu, who made me love people of Sri Lanka even before visiting the country, by daily providing her kindness and politeness. The brilliant Sri Lankan chef Rohan, who gave me an idea about the taste of the local food and made me respect his culinary as an art. The Australian entrepreneur Mike, living more than 20 years in Sri Lanka, who provided a great opportunity to get closer and be part of the adventure. Another Australian Ross, who introduced me to the insular peculiarities and to the local beer. 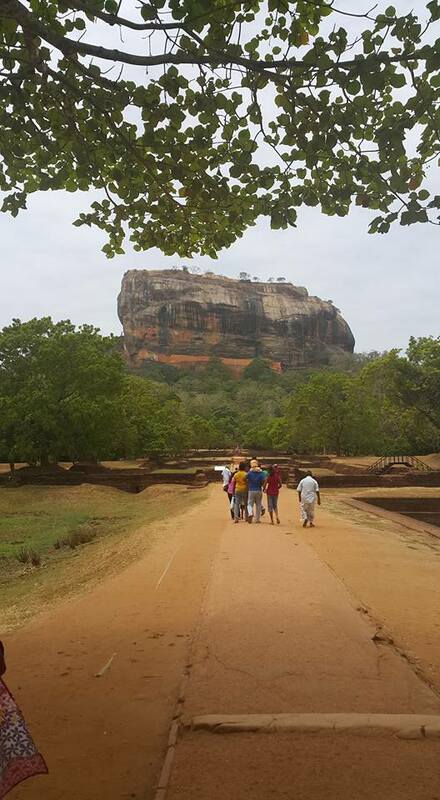 And to all those people, I did not mention above, who just made this trip to Sri Lanka simply unforgettable. Previous Post: Johannesburg again? No, thank you! Nice post. I be taught something tougher on totally different blogs everyday. It can always be stimulating to read content material from other writers. Aw, this was a really nice post. In idea I wish to put in writing like this moreover – taking time and precise effort to make an excellent article… however what can I say… I procrastinate alot and not at all seem to get something done. Thank you for every other fantastic post. The place else may anybody get that kind of info in such an ideal manner of writing? I have a presentation subsequent week, and I’m on the search for such info. Thank you, guys, for the kind words. Your feedback is highly appreciated.